Caiman free games: The Little Eggy That Could by xCept. 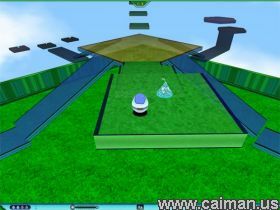 A diffficult 3D platformer 25 levels in 5 worlds. 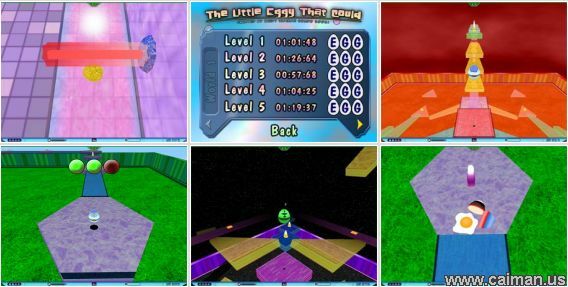 In this game ("The Little Eggy That Could"), you star as an egg who's on a mission to collect all the candy of the lands. See, the Easter Bunny became sick just one day before Easter, and now he's assigned you (the Easter egg) to carry out all of his candy-collecting duties. 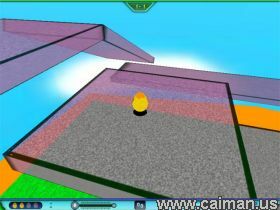 You must make your way through each level while picking up all of the candy that is there to collect. After all of the candy has been collected, a "Golden Egg" will appear which you must locate and jump into in order to be transported to the next level or world. Being the egg that you are, you must be very careful to avoid hazards and to drop only a safe distance before landing each time; otherwise you'll turn into scrambled eggs in an instant! Several powerups and the ability to double-jump should also prove useful throughout the game as you collect the candies.